I love spending time with friends and family during Thanksgiving. Most of my family lives within a few miles of one another. While we do try to get together here and there throughout the year, Thanksgiving is one time we all gather for food and conversation. We always get together at my house for a big feast every year. The food is great, the conversation is fun and engaging, and there are no worries that day. While Christmas has its own place, I particularly enjoy Thanksgiving because everyone settles in front of the satellite television from http://www.direct.tv/direct-tv-deals.html to catch their favorite Thanksgiving special after eating such a big meal. One TV special that we always try to find on the guide is an episode of WKRP in Cincinnati called "Turkey's Away." Mr Carlson, who most know as the station manager, really wants to do something big for Thanksgiving. So, he comes up with a really bad radio promotion idea. He wants to drop several live turkeys from a helicopter over the city of Cincinnati thinking they will float with wings spread to the ground all over the city. The truth is they become more like turkey bombs. The best part is listening to them describe the scene over the radio. Mr Carlson signs off with this quote" As God as my witness, I thought turkeys could fly." I just saw Charice performed at the Rockefeller Christmas Tree Lighting here in New York City. It was aired live on television. The lighting of the 70 foot Christmas tree at the rockefeller center marks the opening of the Christmas holiday in New York. Charice sang "Jingle Bell Rock" while David Foster was the playing the piano. Other performers of the night are Susan Boyle, Boys 2 Men, Jessica Simpson, Mariah to name a few. I've never been all that great at wrapping up presents for people. No matter how much I try, I can never make the folding and the taping look neat, so most of the time I opt for using gift bags and alternative ways to wrap up gifts instead. Besides, I just think that there's something that seems a little more special about wrapping up gifts in bags, they just look like you spent a whole lot more time and thought into them. But since I use so many bags, I make sure to reuse a lot of them and come up with ways to reuse other materials on them to freshen up, just to be thrifty and green. I like to look online to find new ways to wrap up gifts and a few nights ago when I was doing that I saw some stuff about clear tv bundle offers and decided to sign up for one of them. But putting together a recycled gift bag isn't all that hard. I find that it looks pretty chic if you take a plain brown shopping bag and replace its paper handles with some sturdy ribbon and printed wrapping paper on the front. Got so busy cleaning my kitchen today. I did not get a chance to cook dinner. When everybody was getting hungry, hubby asked, "chinese food?" we answered, "nahhhh." I opened the refrigerator, took out the leftover chicken relleno, sliced them and the fry in the pan. It turned out to be so good, kinda crispy on the outside. I also fried some plantains. Dinner was done: yellow rice, fried rellenong chicken and plantains. 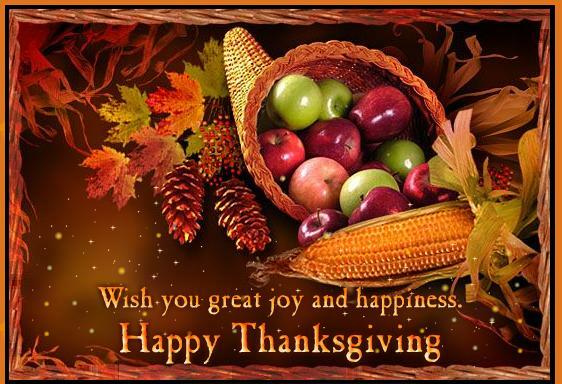 From my household to yours, Happy Thanksgiving To All! My kitchen is closed for the day. All cooked: white pasta, stuffed mushroom, spinach dip, mixed fruits, salad and pecan pie. I'm tired. I need to recharge because this will be a long night. See you later. I was so happy when I got home this evening. As I was parking my car, I saw some men working at the ground floor of our building. You see, I live in a five-storey condominium building that do not have individual mailboxes yet. When the mail carrier comes, he gives all the mails to the door person who separates them according to the unit number. I have not been receiving a lot of my mails or it gets to other units by mistake. This problem made us write the owner of the building requesting for locking mailboxes for each unit. We do not care if it is like P.O. boxes at the ground floor as long as our mails are secured. Thankfully, the owner listened to our request so what happens now is that each floor is going to get their own lockable mailboxes per unit. If you have big parcels and packages that would not fit in your designated boxes, you will get a note from the receptionist informing you about your package. The contractor who is installing the locking mailboxes is the one who installed in the building across our street. They did a pretty good job there according to my friend who lives in one of the condo units there so I hope he will do the same in our building. I cannot wait for the day the owner will hand our keys to our own locking mailbox. Every Saturday from 8 am to 3 pm , there is a flea market at the parking lot of the Giants stadium when there is no game scheduled for that day. We like going to this flea market especially hubby because he gets cheap tennis outfits from a guy who has a store there. They found something in common which is tennis. Hubby has bought a lot of tennis bags and jogging suits from him but recently we have not been seeing around. Maybe he does not like the cold season. I am saying that because if you are at the flea market, you are outside selling with no heat at all. You just have to bundle up enough to keep you warm. People at the flea market are there all year round. One thing that we also like at the flea market is food. It became a habit that we have to stop by our favorite Mr. Corn Man. Once we get to the parking lot, we always check where the yellow flag is located so that we know which way to go to Mr. Corn Man. He sells delicious broiled corn on the cob. Meet Mr. Corn Man ready to peel his corn. After peeling the corn, he will ask you if you want butter on it. Now Mr Corn Man is brushing my corn with butter. You can have nothing, salt, pepper or cheese on it. I bought 3 corn for $5.00. It is $2.00 each but if you buy 3, he will give them to you for $5.00. Tada! I can’t wait to eat them! Still hot! 3. What are you bringing for tomorrow? 4. Hey, what are u guys bringing tomorrow? 5. Do you know anybody that makes good pancit? 6. I’m bringing the leche flan , etc…. 9. Do you want anything from Boston Mkt? Hayyy, I’m so excited to eat…waaaahhh!!! At the start of every school year, we always receive a letter from the school saying that the school building has been inspected and free of asbestos. It is an assurance to parents that they are sending their children in an asbestos free building. We are aware that exposure to asbestos is one cause of mesothelioma cancer where malignant cells are found in the membrane that covers most of a person’s body or organs. To better understand this disease, a book called Surviving Mesothelioma: A Patient’s Guide by Paul Kraus telling his personal experience surviving Mesothelioma cancer. You can also read testimonials from other patients, facts about the disease, how to get legal help and list of doctors who have treated patients with mesothelioma. If you have been newly diagnosed with Mesothelioma cancer, you can get a free copy of this book by simply filling out a form at http://survivingmesotheolioma.com. You can expect to receive your copy within 72 hours. This book is also available at amazon. Google has changed its logo in celebration of Thanksgiving Day on Thursday. A pre-thanksgiving logo. The logo shows everything that we need in cooking our turkey for tomorrow. Are you guys cooking? I am. Have a bountiful feast. It is almost 3:00 o’clock p.m. but I am only having my lunch right now. I was researching for some funny games for both young and old this coming Christmas party. This is my second year of doing this. Maybe they liked what I did last year so they requested me to do it again. It took me a while to finish the list because in between I answered sales calls for direct tv packages. Sometimes I get really tempted to switch to direct TV because of the deals they offer but I am not sure if directv dish is allowed in my building. I still have time to think about switching. My current contract expires at the end of the year. So for my games, I added some new ones like the toothpick and lifesaver relay race, three legged race and the orange chin relay. The musical chair, stop dance and bring me are classic ones for the kids. Now this Christmas games are done, it is time to do my thanksgiving menu for Thursday. We had spaghetti tonight for dinner but i forgot to stop by the store to buy some french bread. I was planning to make garlic bread out of white bread with some butter on it but when i opened my freezer I saw 1 box of texas toast left. Hmmm,...it's perfect for the spaghetti!!!! I just opened the box, toss the 4 slices in the toaster oven and after few minutes you have a bread to pair with your spaghetti. Try it. saw his pictures driving the Chevy Corvette. I don’t think I can afford those cars so with the Mercedes Cl-Class but the Infinity M37 is within my budget and can be my second to the last car before retirement. A lot of the classic wiki cars are on the show too. I will not promise but I try my best to check and update my facebook account regularly. Once I get my phone upgrade, I will be on the roll. Went to the mall with my niece to buy stuffs for Philippines. Got so hungry so we decided to get something to eat. I got this famous terriyaki chicken from Sarku, served with rice or noodles and stir fried vegetables. Your choices are chicken, beef or seafood and you can have extra meat or extra sauce. It is indeed a thank god it’s Friday. It is a dress down Friday, you can come in jeans or sweat pants or you can even wear shorts during summer time. We also have a hour lunch during Fridays. At the lunch room today, there was a lot of discussions about the debt relief programs available these days. There are a lot of companies that offer these services but you have to be careful how much does it cost you to be in this program. One lady said that she already got a debt negotiation letter from one company but she thinks that it is still a scam. Your aim to get into this program is to have a debt settlement in a way that is not so difficult in your present financial situation not to add more burden on you. A guy at the end of the table confessed that he was a victim of these scams two years and up to now he is still paying for it. I am a person that is not comfortable in bringing my money problems on the table especially with people not you do not consider as friends. I was just listening to the discussion but I learned a lot though. I wonder who started it. It was a hot topic, maybe we can have something light next Friday. Ooops, it’s Black Friday next week! Every time I have a sore throat or cough, I tried not to drink medicine. Instead, i boil fresh ginger, make a hot tea, put honey and lemon. For the past days, I almost lost my voice so I have been drinking my homemade tea. When I got to work this morning, I found these 4 packets of ginger tea on my desk. My co-worker gave it to me and mind you, she is not even Asian but she knows china town in ny. The brand is honsei. Ingredients are: ginger and honey. Just pour it in a cup of hot water and tadaahhh, instant tea for me. I only use half pack for one cup. Any time someone needs a pie baked, it seems like they come to me to do it for them. I've been baking pies since I was big enough to reach our kitchen counter and oven handle and I love every minute of it. I just love the time that it takes to shape pie crust into a pie pan or tin and then make the wavy crust. Then the time for actually pouring in the filling is also pretty fun too. But then the part of scraping the filling mixing bowl clean is my favorite. I've always loved eating mixes and batters from the bowl. I'm supposed to bring three pies to our family Thanksgiving dinner this year, so I went online to look for some fun different ideas and inspriation. That's when I saw some information about and chose to Get Clear Wireless Internet. It suprises me how little attention people give their pie crust though. A filling can be the best thing ever, but if the crust is just so-so, then the pie won't live up to its potential. I saw this at my inbox today. 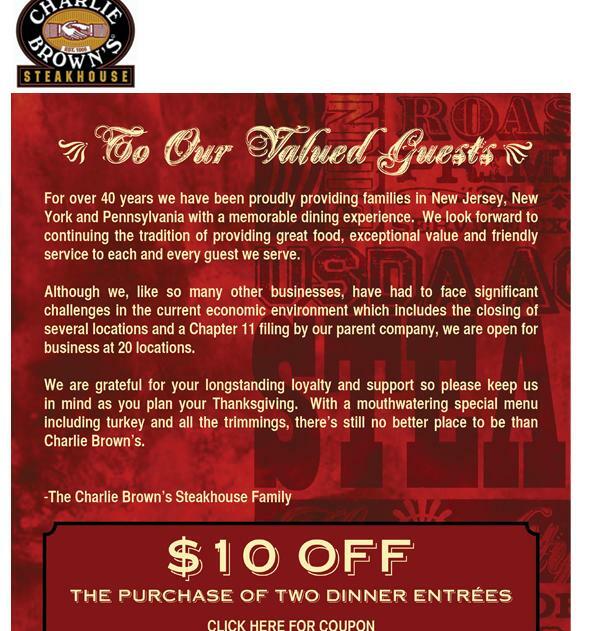 I think Charlie Brown is so sweet to send this to its loyal customers. Hubby and I are one of your loyal customers. Although we will surely miss you at one location but it doesn't mean we will be seeing you less often. Can we see you Saturday night? Our company trip was cancelled and rescheduled because of the tropical storm Tomas that hit the Atlantic last October 29th. There is a big change of plan; the trip will still push through but they are looking for a place that is closer. It was originally planned on a weekend where most schools have Thursday and Friday off so that the kids can go but now that it has been rescheduled for a later date, you can just pick any place and date you want to go (not as a group anymore), equivalent to the price of the original trip. Our target date to go is during my daughter’s spring break. I hope we will get lucky to have a nice warm weather that is perfect for golfing. Hubby has to file vacation leave too and once it is approved, we are all set. I am already super excited for this trip. 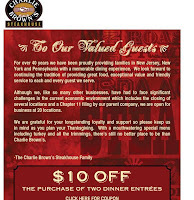 Five branches of Charlie Brown Restaurants in New Jersey are closing and one of them is one next to my job. We love CB especially their salad bar and steaks. Although we don't go to this branch so frequent but we always have our Friday night dinner at another Branch. I always see this restaurant always pack at lunch time and dinner time but I've read that one reason they are closing is "under performance." FF people will surely miss you CB! spring. I think it is never too late for a 44 year old mom with a full time job to get a second career. Who knows one day I see myself enrolling at Walden University. I am interested in their in B.S. in Healthcare Management or Healthcare Informatics course. If you are trying to go back to school and wants news and information about education, get a subscription of The chronicle of higher education. You can also create a free account online so that you can participate in discussions, make comments and join forums. This is also helpful to people looking for jobs or pursuing a new career, like me. While we were trick treating, sometimes the kids will be waiting at the doorstep waiting for somebody to open and give out candies. Other houses care enough to leave some notes. This one made me laugh. To put the word "forgot" is so funny to me. Our receptionist is out again today. This is the second day that she has been calling out sick. The only problem when she is out is that all phone inquiries bounce back to my office that sometimes I cannot even pick it up. My phone is also busy with inquiries from the web hosting company that we just hired for our company website. We answered our customer requests to have our own website so that they can view our products and catalogs. They are tired of receiving our flyers in the mail. Now that we have our website up and running, we felt the need of getting an IT person exclusively to run the website but I suggested to my boss that we just get the managed hosting services being offered by the hosting company. Since we do not really have somebody dedicated to run our website, it is better to leave it at the hands of the experts to monitor our servers, updating and make back ups. The webhosting company even offers colocation if we decide all our servers be brought to their facility and we do not have to worry about anything. I do not really know how my boss is coping to this technology change. He is used in running his business for how many decades without any computers. He is willing and eager to learn. I guess that is all that matters. Little did I know that hubby likes persimmon. When I was packing them to bring to my job for give away, hubby was like "leave some for me." So this evening after dinner, he showed me how to peel the persimmon, just like you peel a green mango. No seeds inside. You can eat the whole thing like an apple. It is crunchy (i guess because it is not over ripe) and the texture is very fine. With regards to the taste, i could say it is similar to our fruit "chico." I still have to get used to the taste but its alright. The first thing I have been taught since I got my first credit card here in the U.S. was to learn how to build your credit history. It is not just a credit history but with a good credit score. To have a good credit history depends on how you manage your finances. I was always advised not to skip payments on any of my bills, do not over borrow money and keep your credit card balances low. So far I have been doing well but when times are rough, I tried not to skip any payments; at least I make it to the minimum. able to get a high score on our credit history. This is a long process but we are so careful with every step we make. I hope this will materialize soon. Last Friday, Hubby was off from work so he came to my job and we had lunch together. I only have a short break so we went to a deli close to my work. While we were ordering our food, we were surprised by the step daughter having lunch next to us. She got a new job very close to where i work and it was her first day. She told us she got a job in a medical office. She used to work at a fast food restaurant as an assistant manager but she got a good offer from this new one. Now we have to get used of her wearing scrubs clothing instead of her black and red uniform at the restaurant. I told the step daughter that she better know where to buy cheap scrubs so that she does not have to spend much money on clothing. We know that she is trying to save money for her school plus she is still paying for her car. Hubby offered her some money but she declined. We hope that this new job will give her security and be a good start on her medical career. My neighbor gave these to me. They are called persimmon. I sometimes see this at the supermarket at the fruit section but never bought one. I don’t know how to eat them but they are shaped like big tomatoes, hard with squash orange color. I'll try them later. Yes, I already started making a list for my Christmas shopping. I wanted to start early and finish early. I have a bunch of god children and they are mostly in the Philippines. Actually, I already bought some boys clothing that I have sent in the box via sea freight to my country about two weeks ago. I bought those last Labor Day weekend when there was a big sale online. The box was filled fast with chocolates, candies and canned goods for Christmas. I hope they arrive before December 25th. I prefer doing my shopping online. I cannot stand the parking and crowd at the mall during the holiday season. Periodically I get coupons in the mail and most of them can be used not only in the store but also online plus many stores have been offering free shipping so I do not bother going to the malls anymore. I am so thankful for the internet; making our lives so easier and convenient. This I cannot do though with my food shopping. I wish I could but it is difficult when it comes to food. I just have to go to the supermarket early or very late at night. have a medicine taste on it. The original jelly beans are still the best. The two day weekend is almost over. It went by so fast yet I felt that I have accomplished a lot. We had a small get together at home with some friends and family to watch the pacquiao vs. margarito fight. I totally forgot about it because I was out with my friend shopping for some ceiling fans for her new house then all of a sudden hubby called me asking if what I am planning to have for dinner. I suddenly bade my friend goodbye and off I went to the supermarket. The ceiling fan shopping can be continued next weekend. Huh, I never thought that shopping for Hansen wholesale ceiling fans would take so much of your time. I have learned what Hunter ceiling fans and Minka aire ceiling fans are. If you have no idea, find out who makes the best ceiling fans here! I decided not to cook anymore. Instead of proceeding to the supermarket, I went to the Oriental restaurant and ordered some food for our dinner. I also suggested that we just go to hooters to see the fight but they wanted to be relaxed while watching Pacquiao beat Margarito so we stayed home. The eating only stopped when the fight started but after Manny won everybody ate again. We all got hungry cheering for Manny. Congratulations Manny for a job well done! As I was driving home from work yesterday, I saw a Hooters Restaurant and right at the entrance there is a big sign "Pacquiao Vs. Margarito 11/13 8pm." Wow, that would be fun watching the Pacquiao versus Margarito fight at Hooters!!! I told hubby about it and he said, "ok, let's go!" then I said, "only if we get a parking spot!!!" So let's see what happens tomorrow. I'm sure it would be packed early. When my friend told me that she was going to start a book club, I was so excited to join it! But then I heard that she was going to hold it on Wednesday nights and realized that I wouldn't be able to go. See, I teach a yoga class as a second job. I picked it up during college and kept doing it after I graduated to help pay off my student loans. But she's still sharing with me what they're reading, so I'm reading them at the same time and just not going to the meetings to discuss them. I got my weekly email from her the other day to let me know a little summary about what they discussed at the meeting and the next book they're reading. After I saw that and looked up to see if the book was available at the library, I saw the site cleartvbundle.com and I think that I'm going to switch over my service to it. The one that they just finished up was by writer Christopher Moore. I had never read his stuff before, but I want to read more of his books. I did not know that Mr. G had an update recently. I lost my PR months ago and I did not expect it to be back soon. You know how Mr. G is sometimes but I'm really really joyful that it is back. Just saw it this morning. Welcome back my PR. Missed you so much. Hot Apple Cider! Yes Please! Fall is my favorite time of year and I love to watch the leaves change, transforming my little town into a beautiful autumn haven. Each fall, I love to take walks with my family on the hiking trails, or around the lake, and watch the colors change. There is nothing compared to being warm and cozy with your family, perhaps a hot cider or cocoa in your hand, while taking in the simple pleasures in life. I make sure that no one else can enjoy the simple pleasures in my life, so every time I bundle up my little ones to take them out I make sure I set my home security alarm (packages HOME SECURITY SYSTEMS) so I can feel relaxed and secure while I'm out enjoying life for everything it has to offer! I know that while my kids roll around in the leaves, or we take a family photo in the picturesque setting, that there isn't anything else that I need to lay focus on. Hot apple cider never tasted so good and I have the pictures of my 8-year-old son to prove such!